About three and a half years ago, I found myself at a loose end so decided to try something that I had never really done before. That something was baking – chocolate brownies to be precise. Since the moment I took that gooey, chocolatey tray of naughtiness out of the oven and slid a spoonful into my mouth, I became hooked. Absolutely, totally and utterly hooked. I can’t remember ever being a massive cake fan but that was the turning point in my life. There’s only one regret I have about that batch of brownies and that is not remembering what recipe I used. Really, I am THAT stupid. Since then I have made countless trays of brownies with a different recipe each time, trying my hardest to either recreate the first batch or better them. I came close the bettering them with a pecan and caramel version but I have to say that this recipe probably tops it. The brownie debate can often get heated and seemingly everyone likes them a different way. I used to think that the gooeyer the brownie, the better. I don’t like them too cakey but fudgey is always a winner. So how about chewy, sweet, slightly gooey and crunchy on top. Doesn’t that sound like heaven? I went to the Drapers Invasion last week and saw chocolate brownies on the dessert menu. I was happy about this but didn’t realise how happy until I popped one of Lizzie’s creations into my mouth. The brownie was chewy, sweet, slightly gooey, fudgey and crunchy on top. A couple of diners around me said that they weren’t chocolatey enough but to me that didn’t matter so much. This brownie is the rebirth of my brownie obsession and so I had to get the recipe to try them myself. 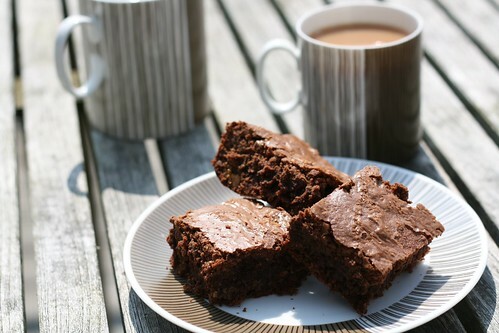 I baked them when I was down at my boyfriends parents house – his dad and little brother are chocolate brownie fiends so I knew that this was a good audience to try them out on. His brother has a nut allergy and requested white chocolate chips so I obliged and threw in some chopped Milky Bar. I also added in another tablespoon of cocoa powder for that extra chocolatey hit. I tried to leave them to cool when they came out of the oven but, as I expected, half of the tray was demolished pretty quickly. I thank Lizzie and a BBC message board user called Sue_L for potentially supplying me with my brownie recipe for life. Pleased you enjoyed them so much – the key is LOADS OF SUGAR…. Yes – it’s the most sugar I’ve ever seen go into anything!!! Naughty. My son is now stalking me lol. He said he loves chocolate brownies and that yours look yummy. So I’ve promised him that we’ll make some on Saturday. Last time i attempted to make brownies they didn’t cook properly, so i hope these work out better than my last lot.